Fenton Art Glass Company is the largest manufacturer of handmade colored glass in the United States and it celebrated its centenary in 2005. The Fenton Art Glass Company was founded in 1905 by Frank L. Fenton and his brother John W. Fenton in an old glass factory building in Martins Ferry, Ohio. 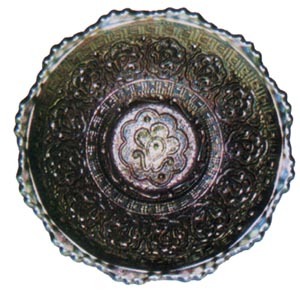 They began by painting decorations on glass blanks made by other glass manufacturers. Soon, being unable to get the glass they needed, they decided to produce their own glass. The first glass from the new Fenton factory in Williamstown, West Virginia, was made on January 2, 1907. Frank L. Fenton’s desire to develop new and unusual colors helped to keep Fenton in the forefront of the handmade art glass industry. During the years from 1905 to the 1920’s, Fenton design was heavily influenced by the artists at Tiffany and Steuben. 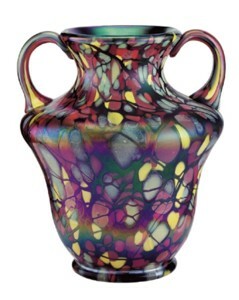 In late 1907, Fenton introduced “Iridescent” glass. This glass, now known as “Carnival” glass, is a popular collectible today. During the 1930’s and 1940’s, Fenton produced practical items, such as mixing bowls and tableware to get through the depression and WWII shortages. They continued working on developing a wide array of new colors. In the late 1940’s, the top three members of the Fenton management team died, leaving Frank M. Fenton, age 33, and Wilmer C. (Bill) Fenton, age 25, to step in and take over as President and Vice President. In spite of other glass factories closing at a rapid rate, Frank and Bill led the Fenton factory through significant American growth for the next 30 years. In 1986, the leadership of the company passed on to the third generation, with George W. Fenton, Frank M’s son, taking over as President. Today nine Fenton family members work together along with over 400 employees to create handmade glass artistry that is loved by collectors around the world. Fenton is known for its beautiful colors and patterns. Each piece of glass is an artistic creation by skilled glassworkers and decorators. So what actually is Carnival Glass?